Veronica and Fernando outside their home in Detroit. 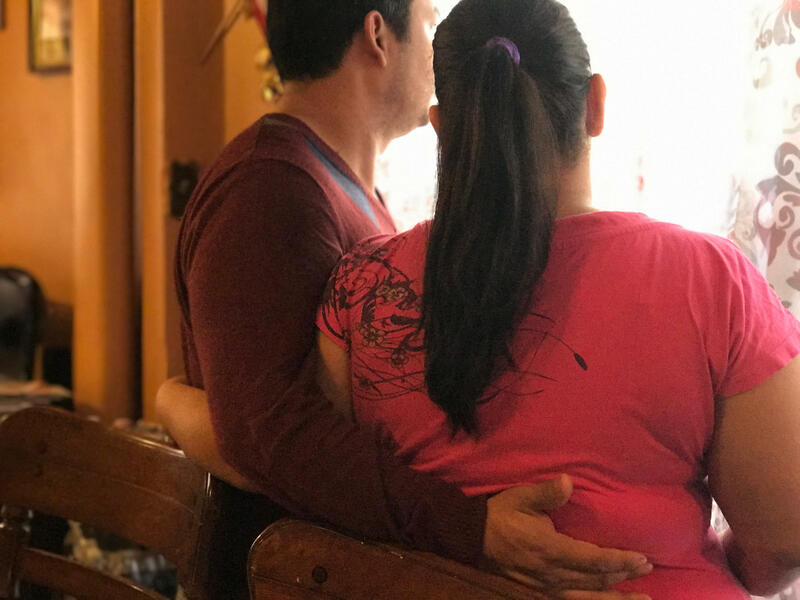 Then, on Tuesday, the U.S. Department of Homeland Security released a new memo saying it’s now a priority to deport, “aliens who … have abused any program related to receipt of public benefits." When food stamps feel like a risk, is it worth having snacks for the kids? In Detroit, Veronica told her husband whether they should get off food stamps, just in case. Veronica lives here in Detroit legally. She’s got a green card. Her four kids were born here in the U.S., so they’re citizens. But her husband Fernando is undocumented. They say he’s not receiving any public benefits, but ask that we just use their first names. Veronica says it feels like a calculated risk just to take the kids to the doctor, since they’re covered under Medicaid. But so far it’s a risk they’re willing to take, she says, since their oldest son has ADHD and their older daughter was diagnosed with PTSD. Fernando and Veronica in their Detroit home. Another woman in Detroit, who doesn’t want us to use her name, told her doctor she wanted to get off WIC because she heard on social media that her kids would have to pay it back someday. Ruby Robinson says his clients are calling him about these fears all the time. He's a supervising attorney at the Michigan Immigrant Rights Center, and it's frustrating when he doesn't have much clarity to give them, he says. So why are these memos and leaks talking about public benefits? As it is, the only way you can legally get food stamps or Medicaid is if you’ve got a green card for five years, or you’re a refugee. But you can get something referred to as "emergency Medcaid" for an urgent, life-saving procedure even if you're undocumented. And pregnant women are eligible for WIC regardless of their immigration status, the idea being that they're carrying babies who will likely be born in the U.S. as citizens. We called up Immigration and Customs Enforcement and asked about the impetus behind the changes, and whether there is public assistance fraud among undocumented immigrants. A spokesperson said he'd look into it, and recommended we call told us the federal food stamps program. Their spokesperson told us that they don't even keep that kind of data – fraud, when it comes to food stamps, usually refers to people selling food stamps for cash. Meanwhile, Fernando, Veronica’s undocumented husband, is so anxious he’s stopped leaving the house except to go to work. The other day, he says, their four-year-old daughter tried to make a joke. According to Mayor Mike Duggan, Detroit has nothing to fear from President Trump’s executive order on so-called “sanctuary cities”—because Detroit is not one. Detroit is sometimes called a sanctuary city because of a 2007 anti-profiling ordinance that bans police from asking about immigration status during traffic stops, while interviewing witnesses, and in most other cases. Donald Trump's recent executive orders have people in some immigrant communities in Detroit worried. Detroit has a large immigrant population, but President Trump's executive order to crack down on undocumented immigration means some families and communities could be separated. Trump’s executive orders will increase efforts to deport undocumented immigrants and build a wall on the country’s southern border. He also wants to cut federal funding to so-called "sanctuary cities" for immigrants. A Detroit immigration attorney accused of bribing a federal special agent is also being accused of defrauding former clients. Attorney Brad Thomson represents some of Charles Busse's former clients. He says Busse made promises he couldn't keep, filed unnecessary documents, and that some people were deported to their home countries because of his mistakes. Thomson says given the federal charges facing Busse, there may not be much money left over for his clients, and it may be difficult or impossible to reopen some deported immigrants' cases. Our conversation with William Lopez and Jerry Clayton. Lopez is a postdoctoral fellow at the University of Michigan's School of Social Work. Clayton is Sheriff of Washtenaw County. As he campaigned for the presidency, one of Donald Trump's most consistent messages was aimed at undocumented immigrants. At one point, he promised a deportation force to remove all undocumented immigrants. That message helped get him elected. It remains to be seen what will actually come to pass once Mr. Trump takes office in two weeks, but the increased possibility of immigration raids is out there.